File Name: Charles L. Griffith of Dayton, Ohio. Notes: Charles Griffith is the author of the Tomart Price Guide and The History of 3 3/4" G.I. Joe, and helped write the filecards released in 1997. Dayton is about 50 miles north of Cincinnati and is notable for the US Air Force Museum and the aerospace research done at Wright-Patterson Air Force Base. Super Trooper is also from Dayton. To my knowledge, Double Blast was never animated. Accessories: black machine gun and tripod (84 Roadblock's), olive helmet (83 Duke's), olive backpack based on 84 Roadblock's but with permanently attached ammo box and no tripod peg (new), black figure stand (common). When the heat is on, the G.I. Joe team calls in Double Blast to add just the right amount of firepower to leave COBRA shell-shocked! This guy is so knowledgeable of handheld weapons that he can take apart, repair, and reassemble a jammed M-60 machine gun in less than 60 seconds—in the dark. Incredible? Yes, but that's why he's a G.I. Joe! A jack-of-all-trades, Double Blast can fix anything with whatever is in his reach. As a kid, he once repaired his mother's broken vacuum cleaner with a rubber band that someone shot at him in school that day. It never worked better and hasn't broken down since. In college, a professor's botched electrical experiment had everyone baffled, except Double Blast. He corrected the error with nothing more than a ballpoint pen and a thumbtack. That got him an A in the class—and a visit from a G.I. Joe recruiter. Leading his squad of gunners against advancing Cobra forces, Double Blast often relies on the element of surprise in his attack strategy. And Cobra never knows what hit them—only that Double Blast called the shots! Toy Notes: Carded in a two-pack with Crossfire. Item #53039. Accessories: silver Uzi (86 Low-Light's), dark grey machine gun (90 S.A.W.-Viper's, with Sound Attack tab), black backpack (91 Dusty's). When the heat is on, the G.I. 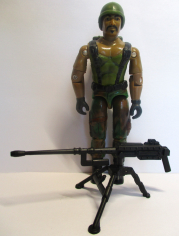 JOE team calls in ROADBLOCK to man the machine gun against COBRA enemies! He's an expert with handheld weapons and can take apart, repair, and reassemble a jammed M-60 machine gun in less than 60 seconds—in the dark. He can fix anything. When he was a kid, he repaired his mother's broken vacuum cleaner with just a rubber band. In college, he fixed a professor's botched electrical experiment with a ballpoint pen and a thumbtack. Leading his squad of gunners against the advancing enemy, ROADBLOCK often relies on the element of surprise in his attack strategy. COBRA never knows what hit them—only that ROADBLOCK called the shots! "I'll pour on the firepower until the enemy retreats!" Toy Notes: Boxed in a B.J. 's-exclusive set with Dial Tone, Snake Eyes, Wet-Suit, Fast Blast Viper, Firefly, Storm Shadow, and Undertow. Item #53227. Identified with Double Blast because the name, birthplace, MOS and personal background are all identical. 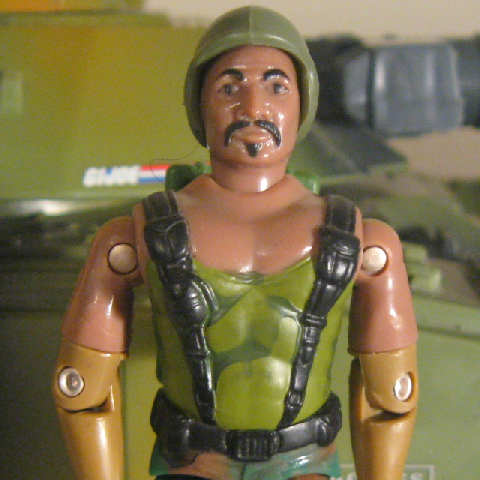 The traditional Roadblock character would return in 2003.